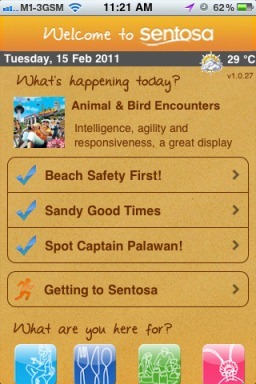 You don’t usually think of leisure attractions as being on the bleeding edge of technology, but Singapore’s premier island resort getaway Sentosa recently introduced its MySentosa iPhone application that offers leisure seekers information on Sentosa including promotions, traffic and weather updates, as well as directions to specific locations around the island via GPS. The new mobile “travel guide” provides users with handy information on the attractions, food and beverage offerings, retail outlets, upcoming events and latest promotions at Sentosa, and even allows them to plan their own itineraries based on personal preferences. Social media aficionados will be glad they can broadcast their “chill-out” intentions on Twitter and Facebook through the app. Now all I want is push notification whenever Tanjung Beach is populated with hot girls in bikinis. The app is available for free on the Apple App Store and a Symbian 3 version will soon be available for Nokia phones.